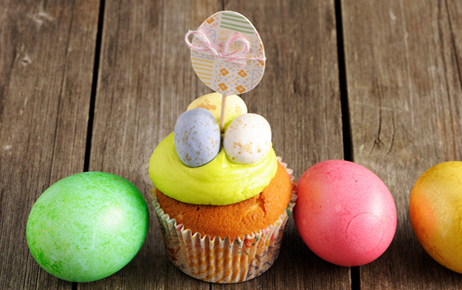 Make your own colourful cupcake toppers for Easter. Print out the template below and cut out the Easter Egg shapes using the scissors in the Bostik Cut 'n Paste pack...watch out for the sharp edges. Colour in and decorate your Easter Egg shapes to yours hearts desire using Rainbow Twisters, Wax Twisters, Colour 'n Paint Twisters and Rainbow Glitter Glue. Centre a toothpick on the back of one of the Egg shapes and secure with a piece of Super Clear Tape. Using the Glue Stick, paste and identical Egg face up, to cover the toothpick. Finally, stick the toothpick with your colourful Easter Egg shape into the centre of your cupcakes.